Setting benchmarks and measuring building performance is vital to designing successful “green” or high efficiency buildings. ASHRAE developed a set of Performance Measurement Protocols (PMP) to provide consistent test methods for the industry to measure energy, water, and indoor environmental quality performance of commercial buildings. The indoor environmental quality section includes acoustical measurements to assess things like background noise levels, speech privacy, reverberation, and sound isolation depending on the building usage. ASHRAE is working on evaluating and updating the PMP guidelines. As part of the process they commissioned a full series of measurements per the current PMP for a number of buildings. Wave Engineering performed acoustical testing for a LEED Platinum building, the Iowa Energy Center IUB/OCA building, in Des Moines, Iowa. The acoustical measurements in the PMP are divided into three groups: Basic, Intermediate, and Advanced. The Basic sound testing involves an occupant survey on acoustics and measurements of the background noise level in A-weighted decibels (dBA), which the client performed themselves. Wave Engineering was enlisted to conduct the Intermediate and Advanced measurements, which require more advanced instrumentation and expertise. The Intermediate level sound testing was performed in several rooms. These tests evaluate the most common sources of annoyance that affect work performance and interfere with communication: background noise and reverberation. Background noise from the HVAC system was measured and reported in octave band levels, dBA, dBC, Noise Criteria (NC), and Room Criteria (RC Mark II). Reverberation Time (T60) was measured in each room and reported in octave and 1/3-octave bands. 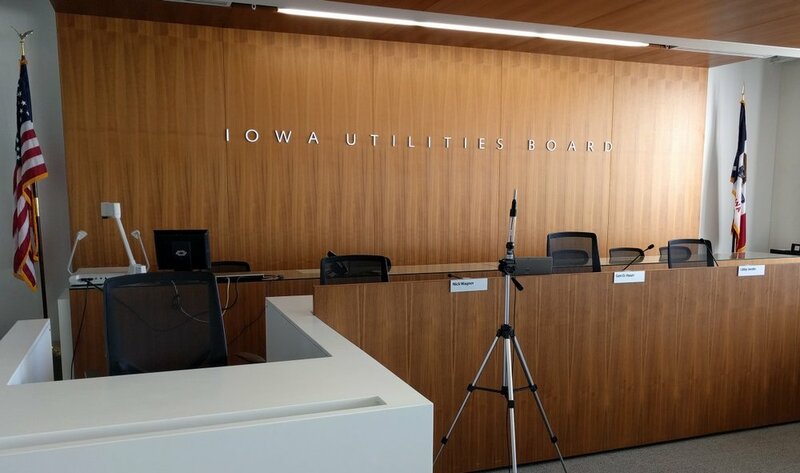 The Advanced level testing was conducted primarily in a Hearing Room used by the Iowa Utilities Board. The ASHRAE PMP book presents several types of acoustical measurements in the Advanced section, and the appropriate measurements are selected for each project based on the room usage. Not all tests will be applicable for all rooms. For the Hearing Room, we elected to measure Speech Communication in terms of the Speech Transmission Index (STI) using a small head-sized loudspeaker at the front of the room and several microphone locations in the seating area. We also measured Speech Privacy using the Privacy Index (PI) to determine whether Board members speaking to each other without microphones could be understood in the seating area. In addition, sound isolation between the Hearing Room and an adjacent room was measured in terms of both Apparent Sound Transmission Class (ASTC) and Noise Isolation Class (NIC). Acoustics are an important part of the indoor environmental quality of a building, but unfortunately many high performing buildings receive poor survey results for acoustics. The success of an energy efficient building is diminished if the occupants must suffer with loud background noise or problems with communication as a result. These goals do not have to conflict with each other, and ASHRAE recognizes the importance of good acoustics by including detailed testing in the PMP book. Wave Engineering can assist with acoustics benchmarking, measurements, new design, and troubleshooting of existing problems.